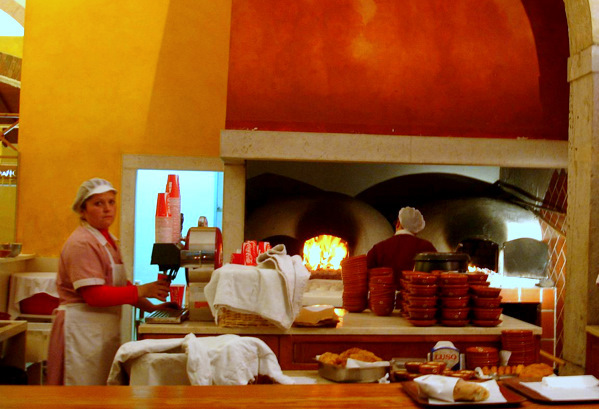 Need a Fabulous Late Night Snack in Lisbon? Check out “Restaurante A Merendeira”! I’ve raved about Portugal‘s amazingly delicious and affordable cuisine, from sunny seafood lunches to rich and meaty dinners, not to mention delectable desserts from the pastelerias.Â But what happens when the all the restaurants, cafes and supermarkets close at night and you’re still open with an appetite? It can be difficult to find someplace that is still serving a bit to eat, and nine times out of ten, the food tends to be less than stellar! Finding places to grab a bite to eat in the wee hours in Lisbon can also be an adventure, but if you happen to be out and about in Santos, the city’s “design district” with plenty of bars and clubs like Bairro Alto, there’s a special place well known by the locals.Â Called A Merendeira, roughly translated to “The Snack Place”, this joint is a far cry from your fast food or jumbo slice pizzeria! It actually serves up some of Portugal’s most classic fare, like pão com chouriço, bread filled with smoked sausage, and caldo verde or “green soup” made with kale and more chouriço – commonly thought of as the national dish here. Both dishes are served steaming hot and fresh, with fresh bread baked in old-fashioned brick ovens right infront of you by adorable Portuguese grandmothers. They even have an antique copper coffee machine for your cup of quality Portuguese espresso to hype you up for the next disco or coctail bar! You an also savour another Portuguese classic, arroz doce for dessert. This sweet rice-pudding sprinkled with cinnamon will surely perk you up. And unlike most crummy hole-in-the wall places you encounter in the early morning hours, filled with people who’ve enjoyed one too many recreational activities, there’s no need to grab your food and run at A Merendeira. They have a cozy, brightly lit dining room with the walls covered in murals of the Alentejo countryside where you can sit at their rustic-style wooden tables and stools to enjoy your homemade soup and sandwich and satisfy your growling stomach.Â And above all, it’s CLEAN, no maneuvering your way through trash or enduring to use filthy, gas-station like bathrooms. The employees do a great job clearing tables, sweeping up constantly and making sure the bathrooms are maintained and refilled with that much needed toilet paper for you drinkers! Nobody really expects to get a gourmet meal in the wee hours of the morning. Many just pray they’ll find something that won’t leave them praying to the porcelin god the following day.Â So I think I am speaking for many then when I say, to find a place like A Merendeira late at night is like a beam of light in the midst of trashy pizza places and seedy fast food joints. Just the aroma of that baking bread is enough to get anyone excited when passing by. Can you imagine being excited about late night food?! And with any luck, this new culinary experience will now make your late night adventures in Lisbon all the merrier.